Objective: To investigate anti-quorum sensing (anti-QS) and anti-biofilm formation (anti- BF) activities of the ethanol extracts of 388 plants. Methods: The anti-QS activity of the plant extracts was evaluated by disc-diffusion assays using the bio-reporter strain, Chromobacterium violaceum CV017. Pseudomonas aeruginosa PAO1, Yersinia enterocolitica ATCC 9610, and Agrobacterium tumefaciens C58, which possess QS systems, were used to evaluate the anti- BF activity of the plant extracts. Results: Among 388 plant extracts, the Cornus controversa (C. controversa) and Cynanchum wilfordii extracts exhibited the strongest anti-QS activity. 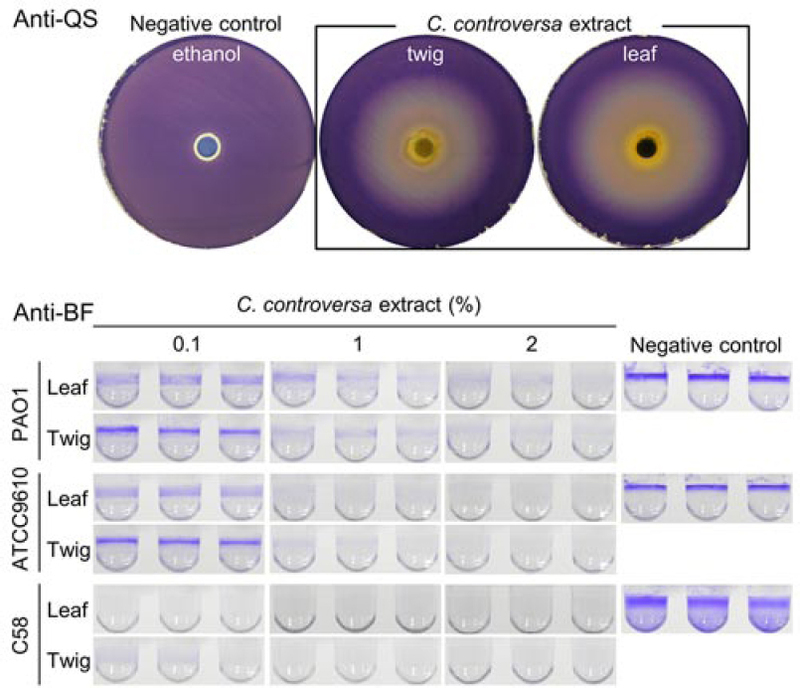 The C. controversa extract exhibited anti-BF activity against Pseudomonas aeruginosa, Yersinia enterocolitica and Agrobacterium tumefaciens, whereas the Cynanchum wilfordii extract exhibited no anti-BF activity against Pseudomonas aeruginosa. In addition, the C. controversa extract suppressed soft rot of cabbage. Conclusions: The C. controversa extract inhibits bacterial QS and BF, and is capable of controlling soft rot. Therefore, this extract has potential for the prevention and treatment of bacterial infections and for the development of alternatives to antibiotics. Quorum sensing (QS) is a chemical mechanism by which bacteria respond to external environmental changes promptly and effectively by using their chemical languages,,,. Upon reaching a threshold bacterial population density, diffusible signal molecules trigger the expression of genes involved in biofilm formation (BF), virulence factor production, motility, bioluminescence, antibiotic production, sporulation, and nitrogen fixation,,,,,. Both gram-negative and gram-positive bacteria are known to have QS mechanism, but there are differences between them. Many gram-negative bacteria produce N-acyl homoserine lactone as a signaling molecule. In general, N-acyl homoserine lactones bind directly to the transcription factor to regulate gene expression,,,,,. Gram-positive bacteria produce autoinducing peptide as a QS signal molecule. When gram-positive bacteria sense a threshold autoinducing peptide, autoinducing peptides bind to the receptor protein and activate two-component system,,,,,. Over the past 50 years, antibiotics have significantly reduced the rate of mortality caused by bacterial infections. However, abuse of antibiotics has led to the emergence of antibiotic-resistant microorganisms. Therefore, the development of alternatives to antibiotics is urgently required. Recently, non-bactericidal treatment modalities that inhibit bacterial activity, such as suppression of QS, have been developed,. We investigated the anti-QS activity of plant extracts. QS-disturbing phytocompounds are reportedly present in the extracts of medicinal plants, marine algae, essential oils, and edible fruits,,,,. These compounds represent a new approach to the treatment of bacterial infections. In the future, combination therapies comprising an antibiotics and anti-QS and/or anti-BF agent may prove useful,,,,. Indeed, as QS is closely related to pathogenicity, anti-QS agents are currently under development,. The plant extracts were obtained from the National Institute of Horticultural & Herbal Science, National Institute of Horticultural Science, South Korea. Plant parts used for extraction are mainly used in oriental medicine. Plant samples were extracted with 80% ethanol for 24 h followed by filtering with Whatman No. 1 filter papers (Advantec, Tokyo, Japan). The supernatants were vacuum-concentrated under reduced pressure. 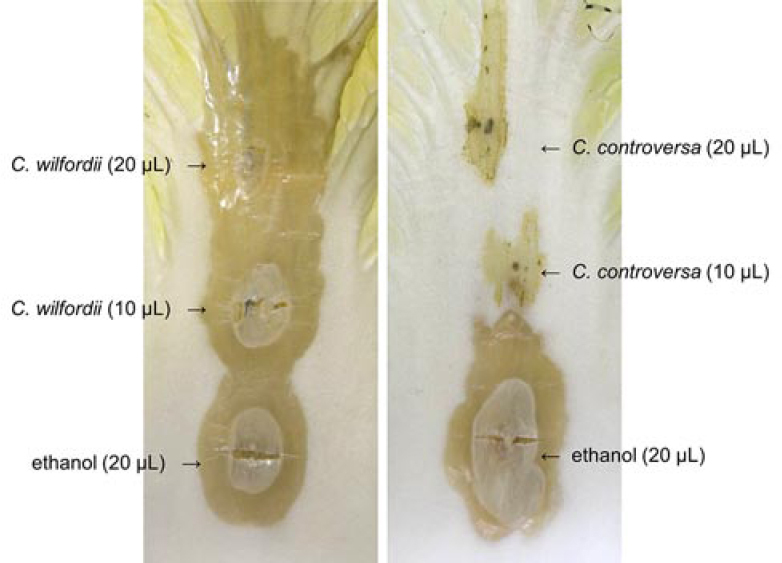 The ethanol extracts of 446 samples (including plant parts of leaf, stem, root, flower, bark, and/or twig) from 388 plants were diluted to 100 mg/mL in 100% ethanol and stored at -20 °C. Chromobacterium violaceum (C. violaceum) CV017 was used for anti-QS assays and Pseudomonas aeruginosa (P. aeruginosa) PAO1, Yersinia enterocolitica (Y. enterocolitica) ATCC 9610, and Agrobacterium tumefaciens (A. tumefaciens) C58 were used for anti- BF assays. C. violaceum CV017 (derived from ATCC 31532) and Y. enterocolitica ATCC 9610 were obtained from the American Type Culture Collection, Rockville, MD. A. tumefaciens C58 and P. aeruginosa PAO1were kindly provided by C. Fuqua, Indiana University, Bloomington, IN. The bacteria were cultured on Luria- Bertani (LB) broth or agar at 28 °C. For biofilm assays, the bacteria were cultured in Agrobacterium (AB) broth at 28 °C. C. violaceum has been extensively studied in QS-mediated violet pigment violacein. To evaluate the anti-QS activity of the extracts, disc-diffusion assays using C. violaceum CV017 were performed; those with such an activity inhibited pigment production, resulting in the formation of a zone of clearance around the disc, as in antibacterial susceptibility tests. Disc-diffusion assays were performed as described previously with some modifications. An overnight culture of C. violaceum CV017 (1/100 ratio) was embedded in LB agar, mixed thoroughly, and decanted into Petri dishes. Sterile paper discs (6 mm diameter) were placed on the LB agar and loaded with the plant extracts (20 μL). After incubation at 28 °C for 24 h, anti-QS activity was evaluated by measuring the diameter of the zone of clearance. As a control, 100% ethanol (20 μL) was used instead of plant extracts. Antibacterial activity was determined by confirming bacterial growth around the zone of clearance showing anti-QS effect. All experiments were carried out in triplicate. BF assays were performed as described previously using P. aeruginosa PAO1, Y. enterocolitica ATCC 9610, and A. tumefaciens C58. The bacteria were shake-cultured in AB broth at 28 °C overnight, and diluted in AB broth to an optical density at 600 nm (OD600) of 0.05. Next, 150 μL of AB medium plus 0.1%-2% ethanol extracts were added to each of three wells of a 96-well plate. The negative control was treated with ethanol instead of the extract. The plates were placed in a plastic box with saturated paper towels and incubated at room temperature for 48 h. The medium was decanted, the wells were rinsed with water, and adherent biomass in the wells was stained by adding 0.1% (w/v) crystal violet for 5 min. Next, the wells were rinsed three times with water and allowed to air dry. Adsorbed crystal violet was solubilized by adding 150 μL 33% acetic acid and the OD600 of the resulting solution was determined using a microplate reader (Bio-Rad). Biofilm assays involved three independent experiments, each comprising three technical replicates. Anti-BF rate (%) was calculated according to previous report: [(Control BF – Treatment BF)/Control BF] × 100. Due to C. controversa extracts used for anti-QS and anti-BF assays were a mixture of twigs and leaves, they were extracted separately from twigs and leaves according to the above-mentioned methods in order to see whether they have higher activity. Anti-QS and anti- BF activity assays of extracts of the twig and leaves of C. controversa were performed according to the above-mentioned methods. For anti-QS activity assays, each ethanol extract (50 μL) was loaded onto a paper disc. As a negative control, ethanol (50 μL) was used instead of plant extracts. The plant extracts (10-20 μL) were loaded onto Chinese cabbage leaves and dried at room temperature. Next, a Pectobacterium carotovorum (P. carotovorum) suspension [10 μL; 7.0 x 107 colony- forming unit (CFU)/mL] was placed at the same position as the plant extracts. The inoculated cabbage leaves were placed in a plastic box with saturated paper towels and incubated for 52 h. Disease progression was examined after 20, 28, 42, or 52 h. All experiments were carried out in triplicate. 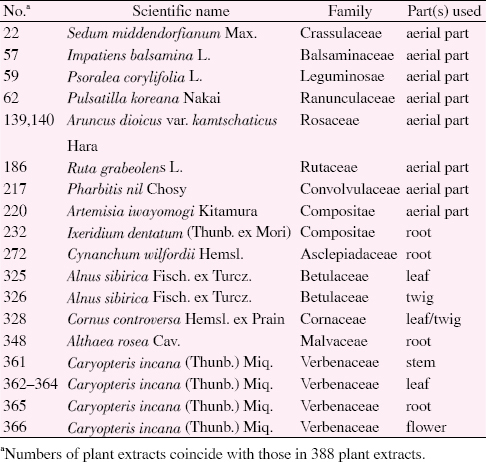 Of the 388 plant extracts, 21 [Table 1] inhibited pigment production by C. violaceum CV017 [Figure 1]. The C. controversa and Cynanchum wilfordii (C. wilfordii) extracts significantly inhibited pigment production by C. violaceum CV017 [Figure 2]. Antibacterial activity was determined by confirming bacterial growth around the clear zone, showing the inhibition of QS-mediated violet violacein production. 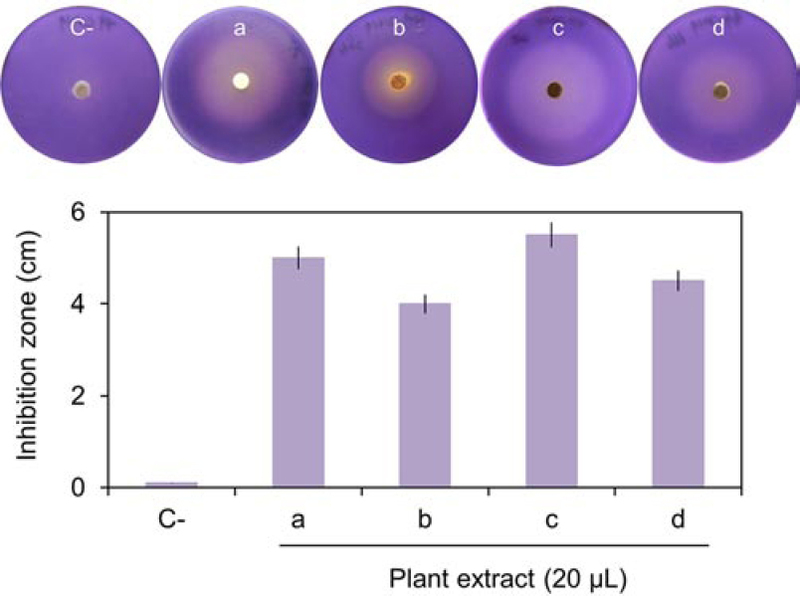 Most of the plant extracts showing the inhibition of violet pigment production exhibited antibacterial activity, however the four of them (Alnus sibirica, Caryopteris incana, C. wilfordii, and C. controversa) showed no antibacterial activity against C. violaceum [Figure 2]. The C. controversa and C. wilfordii extracts were selected for further anti-BF assays and soft rot tests. Table 1: Plant extracts showing anti-QS activity. Figure 1: Anti-QS activity of plant extracts against C. violaceum CV017. Each ethanol extract (20 μΕ) was loaded onto a paper disc. As a negative control, ethanol (20 μΕ) was used instead of plant extracts. Numbers of plant extracts coincide with those in Table 1. Figure 2: Anti-QS activity of four plant extracts against C. violaceum CV017. a, C. wilfordii; b, Alnus sibirica; c, C. controversa; and d, Caryopteris incana. Ethanol (C-) was used as the negative control. Means ± SD are shown. Next, we evaluated the anti-BF activities of the C. controversa and C. wilfordii extracts against P. aeruginosa PAO1, Y. enterocolitica ATCC 9610, and A. tumefaciens C58. Ethanol extract of C. controversa inhibited BF against all three bacterial strains [Figure 3]. The C. wilfordii ethanol extract exhibited significant anti-BF activity against Y. enterocolitica, although the anti-P. aeruginosa BF activity was low [Figure 4]. In addition, the C. wilfordii extract showed a higher anti- BF activity on Y. enterocolitica than the C. controversa extract [Figure 3] and [Figure 4]. Figure 3: Anti-BF activity of C. controversa extract against P. aeruginosa PAO1, Y. enterocolitica ATCC 9610, and A. tumefaciens C58. Ethanol (C-) was used as the negative control. Means ± SD are shown. Figure 4: Anti-BF activity of the C. wilfordii extract against P. aeruginosa PAO1, Y. enterocolitica ATCC 9610, and A. tumefaciens C58. We also assessed the anti-QS and anti-BF activities of C. controversa twig and leaf extracts. There was no significant difference between twig and leaf extracts [Figure 5], and thus twig extracts were used in suppression of soft rot. Figure 5: Anti-QS (C. violaceum CV017) and anti-BF (P. aeruginosa PAO1, Y. enterocolitica ATCC 9610 and A. tumefaciens C58) activities of extracts of twig and leaves of C. controversa. For anti-QS activity assays, each ethanol extract (50 |JL) was loaded onto a paper disc. As a negative control, ethanol (50 |JL) was used instead of plant extracts. P. carotovorum has been extensively studied in QS-mediated virulence factors expression. We determined the effects of C. controversa and C. wilfordii extracts on soft rot of Chinese cabbage, which is caused by P. carotovorum. C. controversa extract suppressed the development of soft rot [Figure 6], resulting in a greenish stain. After incubation for 52 h, soft rot symptoms were evident in ethanol control and C. wilfordii extract treatment, but not in C. controversa extract treatment. Figure 6: Effect of the C. controversa extract against soft rot. Anti-QS is a process that prevents QS by disrupting the signal. This is accomplished by inactivating the signaling enzyme, mimicking the signal molecule, introducing a molecule that blocks the receptor, or by degrading the signal molecule itself without killing bacteria. Using the principle of non-bacteriostasis may prevent the emergence of antibiotic resistant individuals. This interesting research area has led many research groups to the development of QS-disturbing phytomolecules from plant extracts. It will introduce not only a new mode of action and possible validation for traditional plant use, but also a potentially new therapeutic direction for treatment of bacterial infections. Therefore, this study was conducted to investigate plant extracts that can disturb the bacterial QS. Adonizio et al. reported that terrestrial medicinal plants possess anti-QS compounds. Among 50 medicinal plants from southern Florida, 6 plants inhibited QS: Conocarpus erectus, Chamaecyce hypericifolia, Callistemon viminalis, Bucida burceras, Tetrazygia bicolor, and Quercus virginiana. In India, Zahin et al. reported that ethanol extracts of 5 plants among 24 Indian medicinal plants, namely Hemidesmus indicus (root), Holarrhena antidysenterica (bark), Mangifera indica (seed), Punica granatum (pericarp), and Psoralea corylifolia (seed), inhibited violacein production by C. violaceum and swarming by P. aeruginosa PAO1. In China, Priya et al. showed that methanol extracts of the traditional Chinese herb Phyllanthus amarus exhibited anti-QS activity. Damte et al. reported that 6 of 97 plant extracts inhibited pigment production by C. violaceum CV12472, and 16 inhibited the swarming motility of P. aeruginosa POA1. Han et al. demonstrated that extracts of pine needle, green tea, and mugwort have anti-QS activity against the tobacco soft rot pathogen. The plants showed anti-QS activity was inconsistent with plants reported in previous studies,,,. Anti-QS activity of the C. controversa and C. wilfordii extracts inhibited the BF of Y. enterocolitica and A. tumefaciens. Correlation of anti-BF with anti-QS effect is easily predicted, but is exceptional for A. tumefaciens. Nevertheless, there is no data so far that have related QS to BF in agrobacteria,,. It is not known how the C. controversa and C. wilfordii extracts inhibited the BF of A. tumefaciens. This is not due to the inhibition of bacterial density recognition, but because it inhibited the mechanism involved in BF. To our knowledge, no literature has reported that the extracts of the C. controversa and C. wilfordii have the effect of inhibiting the BF of agrobacteria. Studies related to this are considered to be needed in the future. In P. carotovorum, virulence factors production is mediated by QS. Anti-QS activity of C. controversa extract attenuated QS-mediated virulence expression of P. carotovorum. Ethanol extract of C. controversa suppressed soft rot, but extract of C. wilfordii did not show any inhibitory effect. Thus, the anti-QS activity of the C. controversa extract is more broad-spectrum than that of the C. wilfordii extract. In addition, the C. wilfordii extract showed a higher anti-BF activity on Y. enterocolitica than the C. controversa extract, suggesting the potential for use in the food contamination through inhibitory effect on BF of Yersinia spp. Two plant extracts that exhibited anti-QS activity were subjected to assays of their anti-BF and anti-disease activity. C. controversa inhibited bacterial QS and BF, and was capable of controlling soft rot. Therefore, this extract has potential for the prevention and treatment of bacterial infections and for the development of alternatives to antibiotics. This research was supported by Basic Science Research Program through the National Research Foundation of Korea (NRF) funded by the Ministry of Education (2015R1A6A1A03031413). Additional funds were provided from Rural Development Administration, Republic of Korea (PJ00743703). Miller MB, Bassler BL. Quorum sensing in bacteria. Annu Rev Microbiol 2001; 55: 165-199. Rajput A, Kaur K, Kumar M. SigMol: Repertoire of quorum sensing signaling molecules in prokaryotes. Nucleic Acids Res 2016; 44(Database issue): D634-D639. Asfahl K, Schuster M. Social interactions in bacterial cell-cell signaling. FEMS Microbiol Rev 2017; 41(1): 92-107. Papenfort K, Bassler BL. Quorum sensing signal-response systems in Gram-negative bacteria. Nat Rev Microbiol 2016; 14(9): 576-588. Kim J, Kim JG, Kang Y, Jang JY, Jog GJ, Lim JY, et al. Quorum sensing and the LysR-type transcriptional activator ToxR regulate toxoflavin biosynthesis and transport in Burkholderia glumae. Mol Microbiol 2004; 54(4): 921-934. Kim J, Kang Y, Choi O, Jeong Y, Jeong JE, Lim JY, et al. Regulation of polar flagellum genes is mediated by quorum sensing and FlhDC in Burkholderia glumae. Mol Microbiol 2007; 64(1): 165-179. Kumar JS, Umesha S, Prasad KS, Niranjana P. Detection of quorum sensing molecules and biofilm formation in Ralstonia solanacearum. Curr Microbiol 2016; 72(3): 297-305. Swift S, Isherwood KE, Atkinson S, Oyston P, Stewart GSAB. Quorum sensing in Aeromonas and Yersinia. In: England R, Hobbs G, Bainton NJ, Roberts DM, editors. Microbial signalling and communication. Cambridge, United Kingdom: Cambridge University Press; 1999, p. 85-104. Kai K. Bacterial quorum sensing in symbiotic and pathogenic relationships with hosts. Biosci Biotechnol Biochem 2018; 82(3): 363-371. Karatan E, Watnick P. Signals, regulatory networks, and materials that build and break bacterial biofilms. Microbiol Mol Biol Rev 2009; 73(2): 310-347. Hoffman LR, D’Argenio DA, MacCoss MJ, Zhang Z, Jones RA, Miller SI. Aminoglycoside antibiotics induce bacterial biofilm formation. Nature 2005; 436(7054): 1171-1175. Rogers A. Molecular oral microbiology. Norfolk, United Kingdom: Caister Academic Press; 2008, p. 88-91. Di Domenico EG, Cavallo I, Bordignon V, Prignano G, Sperduti I, Gurtner A, et al. Inflammatory cytokines and biofilm production sustain Staphylococcus aureus outgrowth and persistence: A pivotal interplay in the pathogenesis of atopic dermatitis. Sci Rep 2018; 8: 9573. Di Domenico EG, Farulla I, Prignano G, Gallo MT, Vespaziani M, Cavallo I, et al. Biofilm is a major virulence determinant in bacterial colonization of chronic skin ulcers independently from the multidrug resistant phenotype. Int J Mol Sci 2017; 18(5): 1077. Parsek MR, Singh PK. Bacterial biofilms: An emerging link to disease pathogenesis. Ann Rev Microbiol 2003; 57(1): 677-701. Fernandes P. Antibacterial discovery and development–the failure of success? Nature Biotechnol 2006; 24(12): 1497-1503. Ren D, Sims JJ, Wood TK. Inhibition of biofilm formation and swarming of Escherichia coli by (5Z)-4-bromo-5-(bromomethylene)-3-butyl-2(5H)- furanone. Environ Microbiol 2001; 3(11): 731-736. Chung J, Goo E, Yu S, Choi O, Lee J, Kim J, et al. Small-molecule inhibitor binding to an N-acyl-homoserine lactone synthase. Proc Natl Acad Sci U S A 2011; 108(29): 12089-12094. Adonizio AL, Downum K, Bennett BC, Mathee K. Anti-quorum sensing activity of medicinal plants in southern Florida. J Ethnopharmacol 2006; 105(3): 427-435. Musthafa KS, Ravi AV, Annapoorani A, Packiavathy IS, Pandian SK. Evaluation of anti-quorum-sensing activity of edible plants and fruits through inhibition of the N-acyl-homoserine lactone system in Chromobacterium violaceum and Pseudomonas aeruginosa. Chemotherapy 2010; 56(4): 333-339. Sankar GP, Ravishankar RV. Attenuation of quorum-sensing-dependent virulence factors and biofilm formation by medicinal plants against antibiotic resistant Pseudomonas aeruginosa. J Tradit Complement Med 2018; 8(1): 170-177. Adonizio A, Kong KF, Mathee K. Inhibition of quorum sensing-controlled virulence factor production in Pseudomonas aeruginosa by South Florida plant extracts. Antimicrob Agents Chemother 2008; 52(1): 198-203. Issac Abraham SV, Palani A, Ramaswamy BR, Shunmugiah KP, Arumugam VR. Antiquorum sensing and antibiofilm potential of Capparis spinosa. Arch Med Res 2011; 42(8): 658-668. Manner S, Fallarero A. Screening of natural product derivatives identifies two structurally related flavonoids as potent quorum sensing inhibitors against Gram-negative bacteria. Int J Mol Sci 2018; 19(5): 1346. Zahin M, Hasan S, Apil F, Khan MS, Husain FM, Ahmad I. Screening of certain medicinal plants from India for their anti-quorum sensing activity. Indian J Exp Biol 2010; 48(12): 1219-1224. Damte D, Gebru E, Lee SJ, Suh JW, Park SC. Evaluation of anti-quorum sensing activity of 97 indigenous plant extracts from Korea through bioreporter bacterial strains Chromobacterium violaceum and Psendomonas aeruginosa. J Microb Biochem Technol 2013; 5(2): 42-46. Priya K, Yin WF, Chan KG. Anti-quorum sensing activity of the traditional Chinese herb, Phyllanthus amarus. Sensors 2013; 13(11): 14558-14569. Rekha PD, Vasavi HS, Vipin C, Saptami K, Arun AB. A medicinal herb Cassia alata attenuates quorum sensing in Chromobacterium violaceum and Pseudomonas aeruginosa. Lett Appl Microbiol 2017; 64(3): 231-238. Zhang LH, Dong YH. Quorum sensing and signal interference: Diverse implications. Mol Microbiol 2004; 53(6): 1563-1571. Suga H, Smith KM. Molecular mechanisms of bacterial quorum sensing as a new drug target. Curr Opin Chem Biol 2003; 7(5): 586-591. Choi O, Cho SK, Kim J, Park GC, Kim J. In vitro antibacterial activity and major bioactive components of Cinnamomum verum essential oils against cariogenic bacteria, Streptococcus mutans and Streptococcus sobrinus. Asian Pac J Trop Biomed 2016; 6(4): 308-314. Kim J, Heindl JE, Fuqua C. Coordination of division and development influences complex multicellular behavior in Agrobacterium tumefaciens. PLoS One 2013; 8(2): e56682. Chattopadhyay A, Dixit B, Nijhawan P, Kamarudheen N, Rao B. Phytochemical screening, in vitro anti quorum sensing activity and antioxidant activity of extracts of Plumeria alba, Pisonia alba and Cynodon dactylon. J App Pharm Sci 2017; 7(2): 162-166. Alagarasan G, Aswathy KS, Madhaiyan M. Shoot the message, not the messenger–combating pathogenic virulence in plants by inhibiting quorum sensing mediated signaling molecules. Front Plant Sci 2017; 8: 556. Han JH, Paul D, Lee SW, Park JW, Park KS. Aqueous plant extracts as possible Quorum Sensing Inhibitory (QSI) agents against soft rot caused by Pectobacterium carotovorum in tobacco. J Pure Appl Microbiol 2013; 8(1): 63-68. Mhedbi-Hajri N, Yahiaoui N, Mondy S, Hue N, Pelissier F, Faure D, et al. Transcriptome analysis revealed that a quorum sensing system regulates the transfer of the At megaplasmid in Agrobacterium tumefaciens. BMC Genomics 2016; 17: 661. Heindl JE, Crosby D, Brar S, Singletary T, Merenich D, Eagan JL, et al. Reciprocal control of motility and biofilm formation by the PdhS2 two-component sensor kinase of Agrobacterium tumefaciens. BioRxiv 2017; 148429. Doi: http://dx.doi.org/10.1101/148429. Hibbing ME, Fuqua C. Inhibition and dispersal of Agrobacterium tumefaciens biofilms by a small diffusible Pseudomonas aeruginosa exoproduct(s). Arch Microbiol 2012; 194(6): 391-403.